UPDATE JULY 2: Did you get your hands on the Lakers preseason game here in Las Vegas? No? Unfortunately, we have some bad news for you. It took just over 12 hours for Lakers fans to realize that they''' have the opportunity to see King James up close and personal for as low as $30. 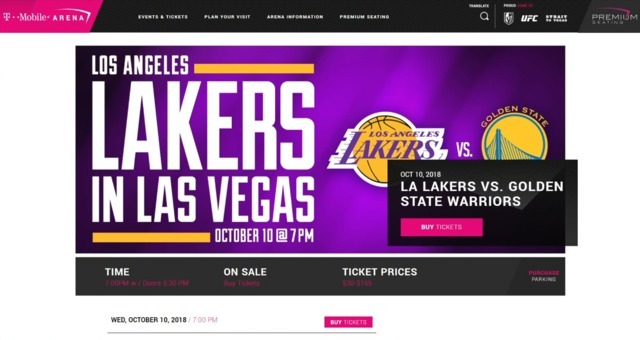 Good Morning Las Vegas captured a screenshot of the T-Mobile Arena website showing tickets available to purchase earlier this morning. As of 11 a.m., the tickets were all sold out. Lakers fans hoping to see LeBron take on his nemesis, the Golden State Warriors, will have to keep a close eye on sights like Stubhub and SeatGeeks for available tickets. ORIGINAL STORY: LeBron James is heading to the West Coast. The NBA star's agency confirmed Sunday he has agreed to a four-year, $154 million contract with the Los Angeles Lakers. This is the second time James has left his hometown team, the Cleveland Cavaliers. He ditched the Cavs for the Miami Heat back in 2010. James helped lead the Cavaliers to an NBA Championship victory in 2016, giving the city of Cleveland its first major sports win in more than 50 years. And LA fans hope he can help make their championship dreams come true, too. The Lakers haven't made the playoffs in five years.